A microtiter plate was coated overnight with various antigens at a concentration of 5 μg/ml. After washing and blocking with PBST+5% BSA, detection was performed using Human Anti-Denosumab Antibody (clone AbD26296) at a concentration of 2 μg/ml and an HRP conjugated anti-DYKDDDDK tag antibody in HISPEC Assay Diluent (BUF049A) followed by QuantaBlu Fluorogenic Peroxidase Substrate. A microtiter plate was coated overnight with denosumab, human IgG2/kappa or human IgG1/lambda at a concentration of 5 μg/ml. After washing and blocking with PBST+5% BSA, detection was performed using Human Anti-Denosumab Antibody (clone AbD2629) titrated to the given concentrations in PBST, followed by detection with Mouse Anti-Penta Histidine Tag:HRP Antibody (MCA5995P) and QuantaBlu Fluorogenic Peroxidase Substrate. Data is shown as the mean of three measurements. A microtiter plate was coated overnight with Human Anti-Denosumab Antibody (clone AbD26296) at a concentration of 1 μg/ml. 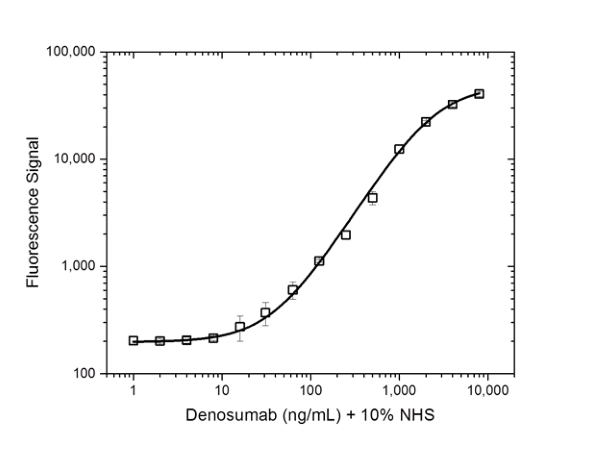 After washing and blocking with PBST+5% BSA, 10% human serum was added spiked with increasing concentrations of denosumab. 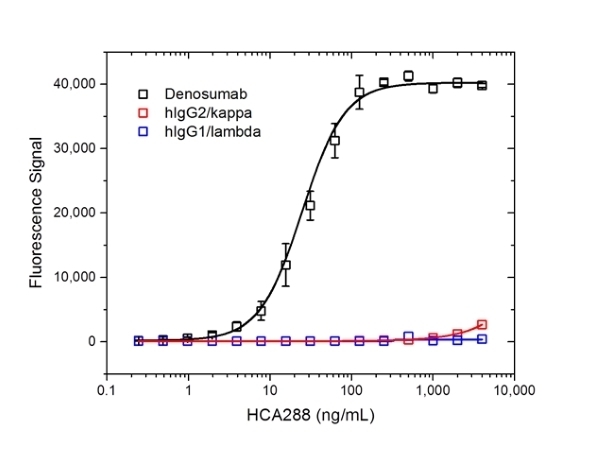 Detection was performed using Human Anti-Denosumab:HRP Antibody clone AbD26295_hIgG1 (HCA280P) followed by QuantaBlu Fluorogenic Peroxidase Substrate. Data is shown as the mean of four measurements. A microtiter plate was coated overnight with recombinant human RANKL at a concentration of 1 μg/ml. After washing and blocking with PBST + 5% BSA, denosumab was added (0.3 μg/ml), spiked with increasing concentrations of each of three Human Anti-Denosumab Antibodies, clone AbD26295_hIgG (HCA280), clone AbD26862_hIgG1 (HCA282), both in monovalent Fab format in this assay, and clone AbD26296 (HCA288). 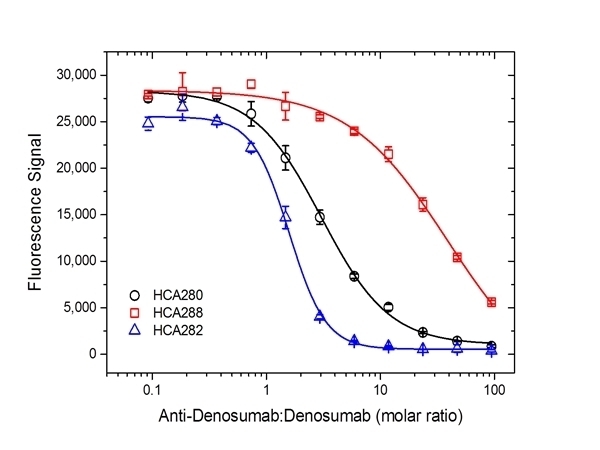 Detection of denosumab was performed using Mouse Anti-Human IgG (Fc) CH2 Domain:HRP Antibody (MCA647P) followed by QuantaBlu Fluorogenic Peroxidase Substrate. Data is shown as the mean of three measurements. Anti-denosumab antibody is a recombinant, inhibitory anti-idiotypic antibody in monovalent Fab format; it is recommended as capture antibody in a PK bridging ELISA format with HCA280 for detection. Human Anti-Denosumab Antibody, clone AbD26296 is a paratope specific, anti-idiotypic antibody that specifically recognizes the monoclonal antibody drug denosumab. 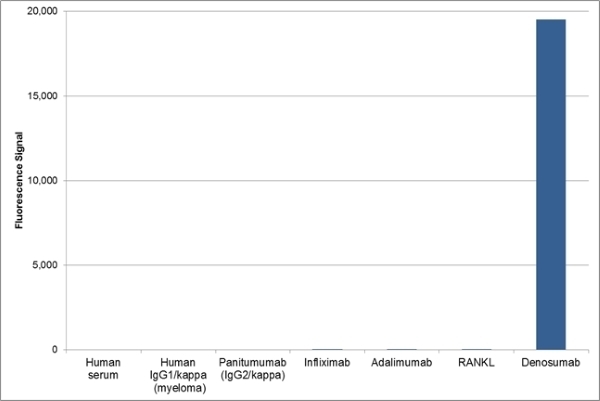 The antibody does not recognize free RANKL (receptor activator of nuclear factor kappa-B ligand), or denosumab in complex with human RANKL and can be used to measure the levels of free denosumab and biosimilar products in bioanalytical assays. A pair of anti-denosumab antibodies can be used to develop a pharmacokinetic (PK) bridging assay to measure free drug. This antibody, in monovalent Fab format, is recommended as the capture antibody, paired with an anti-denosumab antibody in full immunoglobulin format, clone AbD26295_hIgG1 (HCA280) as the detection antibody. Denosumab (Prolia, Xgeva) is a fully human monoclonal antibody (IgG2/kappa) for the treatment of osteoporosis, treatment-induced bone loss, bone metastases, multiple myeloma, and giant cell tumor of bone. The drug specifically binds to human RANKL, a protein that acts as the primary signal to promote bone removal/resorption and prevents RANKL from activating its receptor, RANK, on the surface of osteoclasts and their precursors. Clone AbD26296 can be used in a direct or indirect ELISA system or as capture antibody for denosumab in a bridging ELISA together with HCA280P (AbD26295_hIgG1) as the detection reagent.